If you happen to stroll down the Southern Avenue and pass by the Lake in south Kolkata, you may hear sound of foot-tapping, cheerful cries, and the buzz and stirring murmur from a little distance…a group of budding actors learning techniques of acting under close observation of an octogenarian. His passion for dramatics and commitment is amazing. He’s been training students over the past four decades with utmost devotion and sincerity. Debesh-babu’s address has been Block 5A, Room No 4, Lake Stadium since 1971. He has founded Epic Actors’ Workshop here. 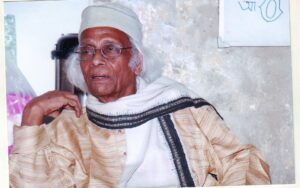 A bachelor, Debesh-babu is a young man of 83. Even at this age, his lust for life and boundless energy is any youth’s envy. He loves putting on a white cap. At the Lake Stadium School, he teaches nuances of acting, body language and gives tips on how to pronounce words correctly while acting. Students are also taught the history of drama. Debesh-babu trains students in Stanislavsky’s system of acting which is known as Method Acting. “Stanislavsky’s system of acting is the foundation of Strasberg’s technique. Rigorous adherents of Strasberg’s technique are commonly referred to as Method Actors,” he says. His students are also taught about Brecht’s Theory of Alienation. Tagore’s Ebar Phirao More has been his passion. He reads out from Tagore’s classic to train his students how to pronounce words immaculately. He can recite Tagore’s Prithibi and Jhorer Kheya with elan and effortlessly. Debesh-babu talks about maestros like Utpal Dutta, Shambhu Mitra, Tulsi Chakrabarty, Sabitri Chattopadhyay, Ebrahim Alkaji, Habib Tanvir and Girish Kanrad. He unfolds interesting anecdotes about these great actors/dramatists as students listen to him with rapt attention. What strikes one about him are his clarity of thought and his profound understanding of drama. The drama teacher also interviewed Alkazi. Debesh-babu is a strict disciplinarian who does intensive research before producing a play. Debesh-babu is an avid fan of classic movies. Charlie Chaplin, , John Gielgud, Charlton Heston, Charles Laughton, Marlon Brando, Alec Guinness, Gregory Peck, Lawrence Olivier, Vivien Leigh, Sophia Loren, Audrey Hepburn, Elizabeth Taylor are his favorite actors. Richard Schechner, Professor of Performance Studies at the Tisch School of the Arts, New York, visited his training centre a number of times. Debesh-babu’s students also participated in the training sessions at Kolkata’s American Center. A consummate performer, Debesh-babu went to the US in 1999 and traveled across North America for six months setting up workshops for acting lessons. He also set up a drama group in New Jersey by the same name — Epic Actors’ Workshop — which is led by his student Prof Dipan Roy. Born on November 8, 1932, Debesh-babu’s native village is Outshahi in Bikrampur district (in Bangladesh). Currently he’s been staying at Katjunagar (Jadavpur). He got his training in the art of acting from legendary actor-playwright Utpal Dutt. He acted in Dutt’s epoch-making drama Kallol. He also acted in Angaar, Manusher Adhikare, Ferari Fouj, Titas Ekti Nadir Naam. Among the street dramas he took part in were Din Bodoler Pala, Special Train and Samajtantrik Chaal. He produced and directed a number of dramas: Narottam adapted from Moliere’s Tartuffe and Surendra Vinodini (written by Upendranath Das) and Nayaparoana (against the backdrop of the 1857 rebellion). He also directed Malbazarer Ma Malati adapted from Brecht’s St Joan of the Stockyards and Tagore’s Bisarjan. He also produced Kono Ek Gayer Kotha adapted from Turgenev’s Hunters’ Sketches. Ardhendu Chakrabarty did the adaptation into Bengali. Michael Madhusudan’s Buro Shalik er Gharero and Ekei bole Sobbhoyta were staged and he also presented Utpal Dutt’s street drama Special Train. He loves reading books, visits art exhibitions, watches football and listens to songs. “I wanted to become a football player. Legendary Bagha Shome was my hero,” says Debesdh-babu. It was Shome who trained Debesh-babu when he was young. He couldn’t pursue his passion soccer as he couldn’t afford a boot. He’s an extraordinary cook; he does all household chores by himself. He mops floors, cleans up his house and even washes his clothes and utensils single-handedly. He’s a tea connoisseur. He won’t let anyone make his tea. Walk into his acting school near the Lake and he’ll treat you with a fabulous flavored cup of tea. Debesh-babu is well-built, broad-chested; his arms are muscular. He has a pair of magnificent eyes. Even at this age, innocence oozes from his countenance. Walk into his office around 4pm, you’ll be amazed to see the grace and dignity of his bearing. He abhors traveling in a taxi; he always takes a bus from Katjunagar to Lake Stadium. His extraordinary zeal and vigor even at this age is remarkable. He loves dreaming even now and shows his students how to dream!! May you remain in fine fettle and keep training budding actors! !